The trend of USL teams playing at Minor League Baseball ballparks has created an interesting situation in both sports. While the number of USL teams at MiLB ballparks has grown steadily and led to some mutually beneficial arrangements, developments over the coming years will cause that landscape to shift rapidly. This season, the already sizable list of USL clubs playing in MiLB ballparks grew. Four of the USL’s new teams for 2018—Atlanta United 2 (based in suburban Gwinnett County), Fresno FC, Las Vegas Lights FC, and Nashville SC—are playing at MiLB ballparks. When adding in returning clubs that play at MiLB ballparks and Seattle Sounders 2’s shift of home matches to Tacoma’s Cheney Stadium, the number of active USL teams at MiLB facilities stands at nine. There are a couple of factors that have allowed this trend to unfold. First, MiLB facilities have served as solid venues—either on a short or long-term basis—in markets where USL has sought to expand, but where no immediate options for a Division II soccer-specific stadium have existed. Additionally, more MiLB owners have bought into the USL, helping to ensure continuity and stability in markets like Reno and Tulsa. That trend will continue into 2019. Of the seven expansion clubs announced for the 2019 USL season, three will play in MiLB ballparks and two (El Paso, Memphis) will be controlled by the same ownership groups as their MiLB co-tenants. Those developments will enhance the USL/MiLB facility landscape in the immediate future, but the picture will change greatly in the coming years. In the case of Las Vegas, baseball’s 51s (Class AAA; Pacific Coast League) are slated to move into a new ballpark in suburban Summerlin next year. 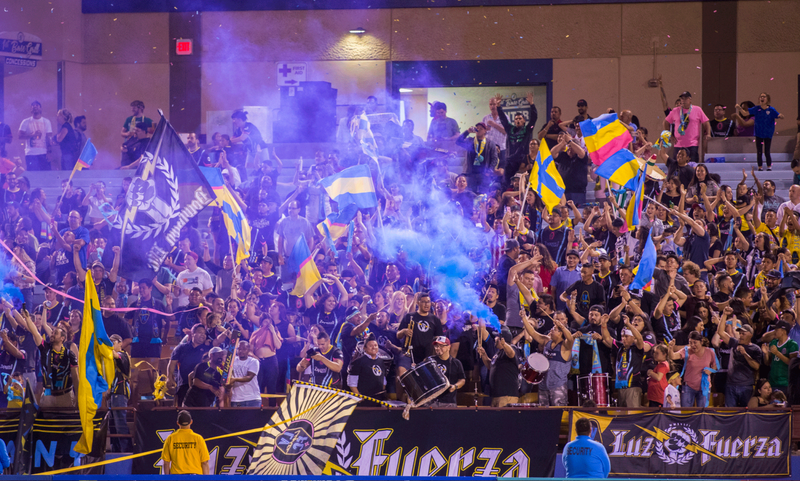 That will leave the Lights as the main tenant of Cashman Field, and allow club owner Brett Lashbrook to make improvements that create a more soccer-friendly facility. Louisville City FC will also depart Louisville Slugger Field in the coming years, moving into a new soccer-specific stadium scheduled to open in 2020. Not all clubs will pursue projects as broad as what Louisville has in the works—an 11,300-seat stadium that could be expanded for MLS and will anchor a larger development project—but there are signs that more soccer-specific stadiums could be on the way. Reports have suggested that soccer-specific stadiums are part of the long-term strategy in markets like Tacoma and El Paso, and Nashville is planning a new soccer-specific venue for its eventual move to MLS. Nashville could begin MLS play before the new stadium is completed, but it is not guaranteed that First Tennessee Park—shared with baseball’s Sounds (Class AAA; Pacific Coast League—will see any MLS action, especially since the city features an NFL facility in Nissan Stadium. It is also not always a guarantee that USL will expand into a city with an existing MiLB team and use its ballpark. For instance, both Hartford and Birmingham feature modern Class AA ballparks, but owners of 2019 USL expansion clubs in those markets have pursued different facility plans (Birmingham Legion FC will play at an expanded BBVA Compass Field, while Hartford Athletic will call a renovated Dillon Stadium its home). In other words, the landscape of shared MiLB/USL facilities is very fluid and subject to considerable change in the coming years. That said, it is easy to see where there have been benefits for both sports. Though their current numbers cover a wide range—from Nashville’s 11,039 fans per-game, to Penn FC’s more modest average of 2,088 at Harrisburg’s FNB Field—the slate of USL clubs playing at MiLB ballparks generally draw solid attendance figures, and factor into the league’s overall growth. Additionally, the presence of USL clubs gives many MiLB operators the advantage of a non-baseball event that keeps their facilities active while in some cases broadening an ownership group’s portfolio. The shared MiLB/USL facility trend has grown in recent years. It is very likely to evolve in the coming years, but it has created situations that have been mutually beneficial for both leagues and has helped USL grow. Image by L.E. Baskow / Lights FC.